exile | Book Hub, Inc.
All through her long busy life in America, Nora Percival felt impelled to learn about the family she’d left behind in Samara, the city on the Volga where she was born. After glasnost she was finally able to go there and find the places, though not the people, of her youth.Her search resurrected childhood memories of revolution, civil war, famine and exile, which she felt impelled to share, “to speak for so many others who have silently endured the loss of all they valued.” In her book the reader will meet the extended family who faced many trials in those chaotic years, and will be moved by their steadfast togetherness through want and woe. The reader will share the love and courage that sustained them and helped them survive hunger and despair, the humor that cheered dreary days and the strength that carried them through affliction and calamity. Readers will cry over their sorrows and enjoy their small triumphs, and they will live again in memory. 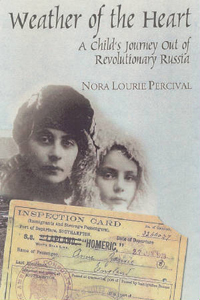 Nora Lourie Percival was born just after World War I in Samara on the Volga River in Russia. The revolution drove her father out of the country to safety, and her family lived through a civil war and a famine. These tribulations were recorded in “Weather of the Heart,” her first memoir. In 1922, the family was reunited in New York, where Nora grew up. The author’s career has been largely in the editorial field. She has worked for Random House, the American Management Association, and Barnard College. Now long retired, she is still writing and working as a freelance editor. An only child, she has raised five children and now has eleven grandchildren. She lives in the mountains of North Carolina, where she enjoys the natural beauty and is inspired by the literary renaissance in the South.